Over the weekend before the torrential rains came, I was heading out to volunteer usher an Off-Broadway play when I saw an incongruous sight on the fencepost outside my modest abode. It inspired an inner dialogue. Me (asking myself): Is that a hat? Me (answering myself): No, it’s a Frisbee, you moron. I inspected it closer and touched it gingerly, as my childhood fear of cooties collided with my adult terror of bed bugs. As soon as I entered the theater I rocketed into the restroom and washed my hands with such vigor, I could have easily performed surgery as well as hand out Playbills. See me, feel me, touch me. 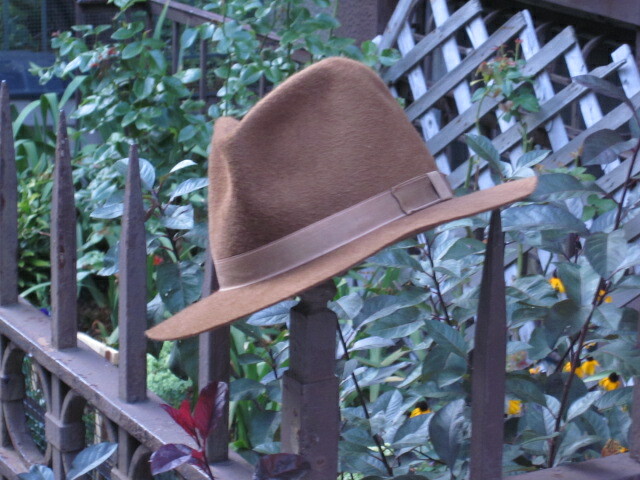 Back to the hat, when I peeked under the brim I saw that it was unlined fur felt, size 7 1/8 and made in the USA, but the manufacturer was unidentified. 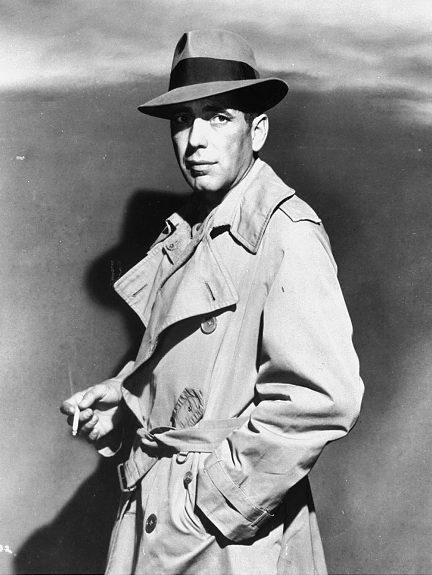 Basically, it was a cheap hat, unlike the rabbit fur felt fedora, coincidentally the color of Bugs Bunny, which I purchased for a king’s ransom at Worth & Worth on West 57th Street half a lifetime ago. 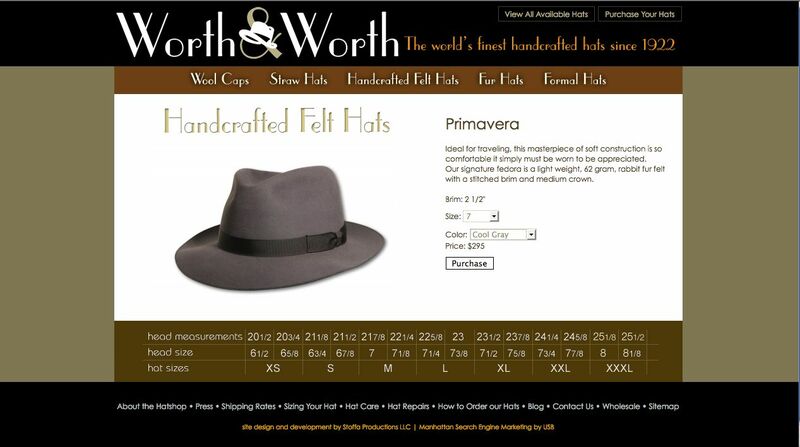 Quality fedora made from Bugs Bunny fur. I wore that hat for two or three years throughout the fall and winter seasons. Although it was an extremely well crafted and lovely chapeau, I looked like the consummate idiot in it. A then-skinny twerp with a big nose in a big hat — not the most winning combination. Also, I felt guilty about wearing bunny. Humiliation eventually dawned on me and I donated my hat to charity. He: Are you really taking that ghastly hat with you? She: Of course, silly, it’s my trademark. He rolls his eyes. She notices and gets defensive. She: What’s your problem with my hat? He: It makes you look fat. In warp-speed that hat lands on the fencepost. I suppose I should add that He is gay. Or, possibly one of the movers from Mad Men Movers was wearing that hat when they arrived to move the tenant out? When the most Don Draper-ish of the movers started sweating profusely within a nano-second of heavy lifting, he left it on the fencepost. Then, he noticed a dish noticing him; he completely forgot about his hat and pursued her as his colleagues completed the move. A third case scenario could be that someone had the same epiphany I had about my fedora many years ago. They caught a glimpse of their reflection, realized they looked like a Bogey-worshiping nerd, and they hung it on the fencepost when no one was looking. "Take my advice, Kid, do yourself a favor and lose the hat." When I returned home, the mystery hat was gone. Where did it go? I don’t know, but it didn’t blow into the garden. Possibly someone with no fear of cooties or bed bugs is wearing it right now. 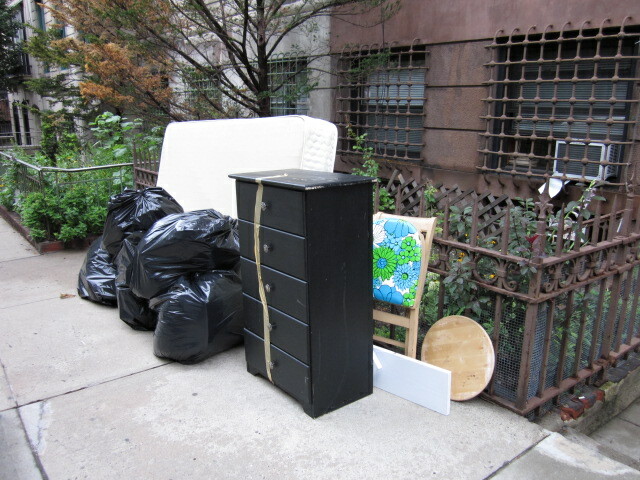 It was replaced with a pile of the usual former tenant detritus denied a ticket to ride to the next location. 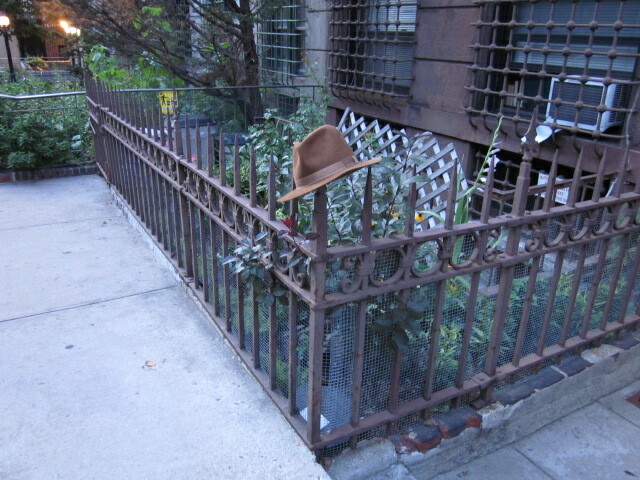 Usual Tenant Detritus -- bring back the hat! This entry was posted in Humor and tagged apartment, bed bugs, bogey, fedoras, hats, humphrey bogart, mad men, mystery, tenants. Bookmark the permalink. Bring back the hat, indeed! Thanks for sharing that great post, Kathy. I was half-expecting to see you or your dog wearing the mystery hat at the end. It looks like an Indiana Jones fedora! This post just goes to show that you can write something interesting about anything. Thanks for sharing! Or, maybe this post shows that I’m such a typing windbag I can write something about anything! Thanks for checking in Katie. Windbag? I think not. I also think you might have been cuter than you thought when you were sporting yours around town. Y’know, in that kinda sad, slightly dorky, physically awkward, but interesting looking sorta way. I would have taken the hat, expecting to one day brave inhibition, then after 6 months returned it to that same post, never having touched my head. You globe-trotting photographers are far more daring than me, Allen! Since we don’t know, maybe someone did exactly as you would have done and there will be a sequel to this post come February!